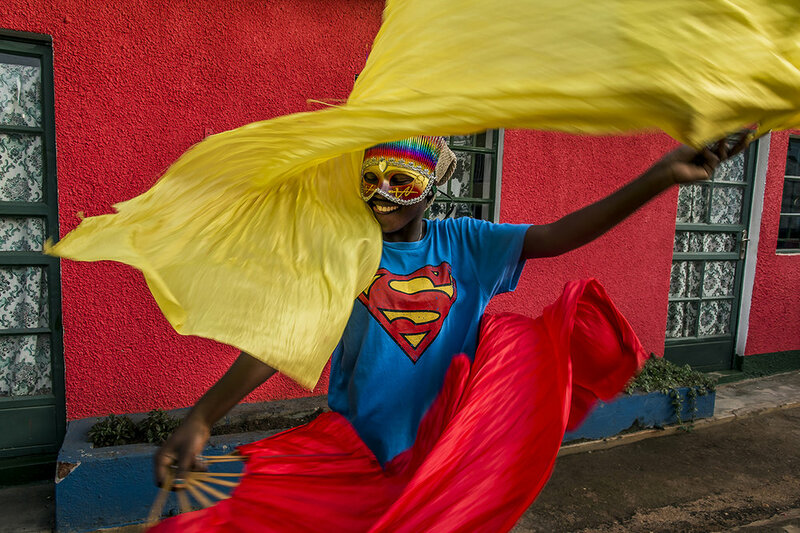 Hiccup Circus Uganda's artists use magic and juggling to convey messages of social inclusion, gender and health among at-risk youth in their own neighborhood, the Namuwongo suburb of Kampala, schools and ghettos in the capital city. For that purpose, they carry around a trapeze made with fabric and the background of their stage. There are no elephants or lion tamers. In this modest circus, the scene is a simple backdrop with drawings painted by the artists themselves, also authors of the soundtrack of the exhibition. In a small courtyard of Namuwongo slum in Kampala, between a number of magics and juggling, a group of young people trains in order to use circus arts to address issues such as social inclusion, addiction, environmental protection , the danger of contracting HIV and the importance of not dropping out of school. All members of Hiccup Circus Uganda were born in this depressed suburb of the Ugandan capital where about 25,000 people live. To raise funds to make a living, they organize a paid performance per week for the expatriate public. Uganda has one of the youngest populations on the continent. About 52% of nationals - 18 million people - are under 15 years old. The youth unemployment rate is very high and can reach 80% in some parts of the country.